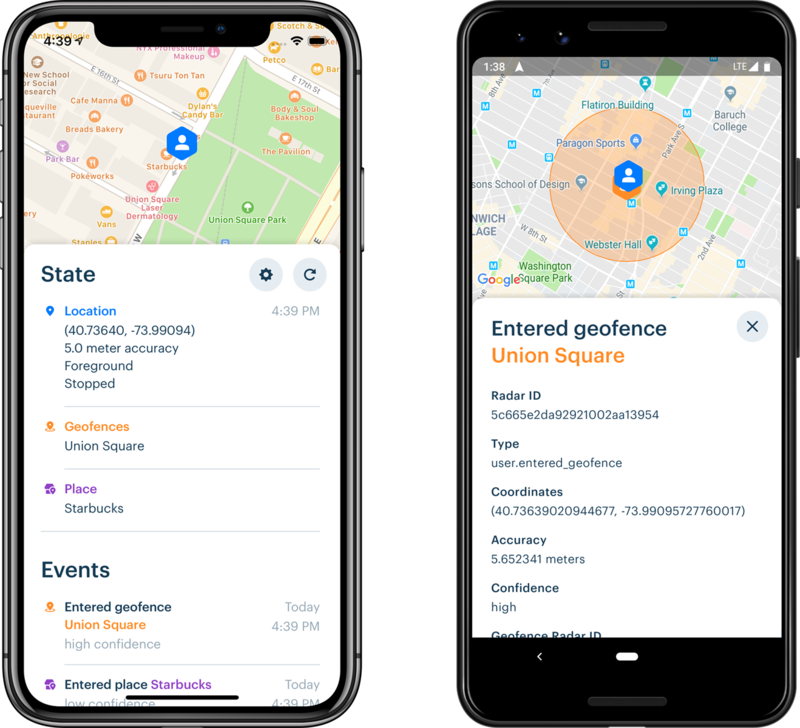 You can use our Toolkit sample apps for iOS and Android to test Radar before integrating the SDK, or to test your implementation of Radar side-by-side with a complete implementation. To get started, you'll need a Radar account. Don't have a Radar account yet? Sign up first. Download the app from the App Store (iOS) or Play Store (Android). Open the app and grant notification permissions and location permissions. Copy your Test Publishable key from the Keys section of the Settings page and paste it into the app. To track in the background, turn on Tracking (it is on by default). Turn on the notifications you want to receive, including Events (events received from Radar), Locations (location updates sent to Radar), and Errors (network, location, and permissions errors). To track once in the foreground, tap the refresh button! If you correctly granted permissions and pasted your API key, and if you have connectivity, you will see your current state in the app and see your user on the Users page in the dashboard. If you are in a geofence or at a place, you will see events in the app and see events on the Events page in the dashboard. To track in the background, move more than 100 meters! Note that the SDK will wake up while you are moving (usually every 2-3 minutes), then shut down when you stop (usually within 3-5 minutes). To save battery, the SDK will not wake up when stopped, and you must move at least 100 meters from a stop (sometimes more) to wake up the SDK. Have questions after reading the documentation? Visit our Help Center. Still have questions? Click the button on the bottom right of any page to chat with us.